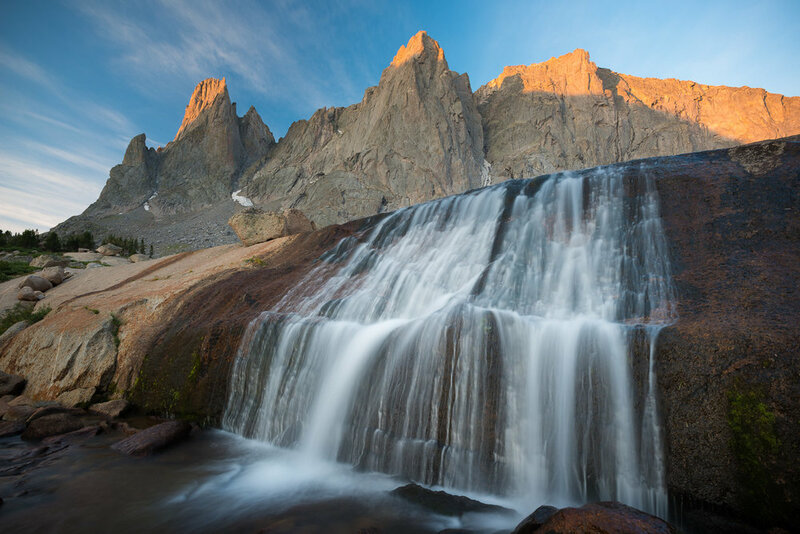 Aptly named, the Cirque of the Towers is a round glacier-carved valley ringed by towering granite mountains. 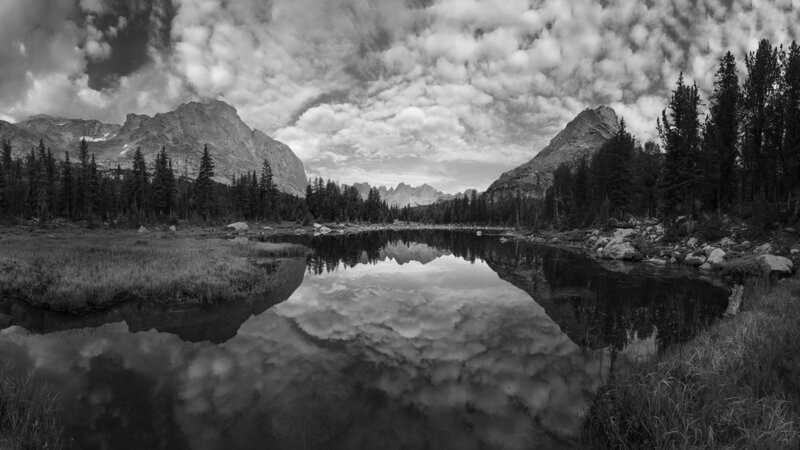 Extremely remote, the cirque was rarely—or perhaps never—accessed before its naming by climber Orrin Bonney in 1941. Today, it is a fabled destination for climbers, backpackers, and photographers able to make the multi-day journey. 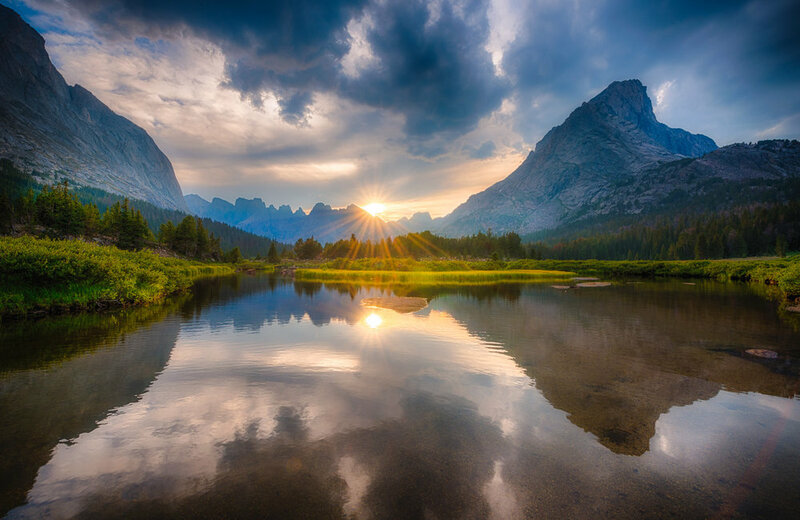 Join Marc Muench and Michael Strickland on an adventure into the wilds of Wyoming! The cirque is located in Popo Agie Wilderness, accessed by a single trail that winds between numerous alpine lakes and among wildflowers. While many elect to traverse the trail on foot, we’ll be using horses to carry us high into the mountains. 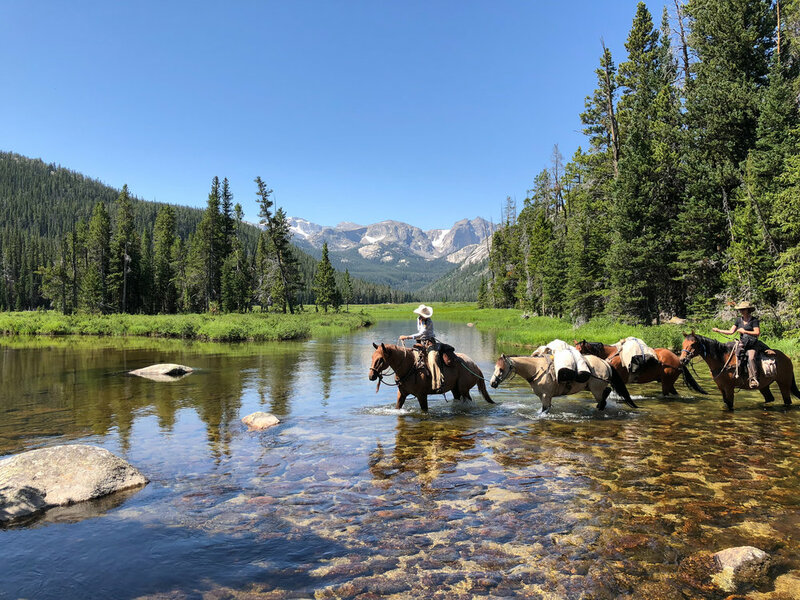 Don’t worry if you aren’t a skilled rider—our experienced outfitters will match each of us to our sure-footed horse, so you can just concentrate on enjoying the view. Our gear will follow us, safely packed on the pack horses. Once at our comfortable, fully-outfitted camp, we’ll have plenty of time to photograph this extraordinary area. 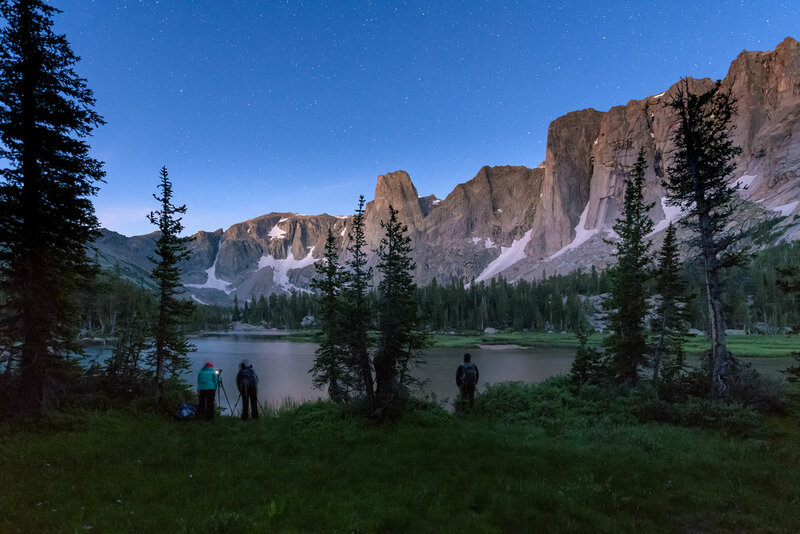 You’ll have great views right from your tent, but we’ll also explore the nearby alpine valleys, lakes, and waterfalls on day hikes. Since it will be spring time in the mountains, meadows full of wildflowers are even a possibility. Both of your veteran landscape photography instructors will be teaching you a number of techniques: focus stacking, use of shallow depth of field, composition building, and more. You’ll also learn to create stunning nighttime images under some of the darkest skies in the country. Ready for a wild photographic adventure? Read on! July 20, 2020: We’ll meet up at the Diamond 4 Ranch in the early afternoon—we’re happy to help with any questions you may have on getting there—for a orientation on riding from one of the wranglers. Afterwards, we’ll have an early dinner, finish our last minute packing, and get some much needed sleep ahead of the next day’s long ride. Diamond 4 Ranch is located at 8,000 feet in elevation, so this overnight will help our bodies acclimate for our 9,500 foot alpine camp. July 21, 2020: We’ll begin the day early with an introduction to our horses, and a review of rider safety. There will be sack lunches packed for the day and plenty of fresh filtered mountain water. Our ride will take most of the day—with frequent stops along the way for rest and photography—so we’ll plan on arriving into camp by 4:00 PM. Supplies will already be in camp, but everyone is expected to help set up the tents and fill water containers. Once settled into our private tents, we'll have time to take a brief walk to photograph sunset. Dinner will be under the stars, around the warm glow of the campfire. July 22–24, 2020: Each day will start well before sunrise with hot coffee and snacks. We'll make our way to our sunrise shooting locations mostly in the dark, arriving just before the alpine glow begins. We'll plan for a big hot breakfast in camp following each morning shoot, followed by some down time for rest. The afternoon hikes will begin at various times based on the location chosen. You will be required to walk to each location carrying your camera pack, water bladder or bottle, rain gear and snacks. On return, dinner will be waiting for us under the stars. On nights with clear skies, we’ll photograph the Milky Way over glacial lakes and gnarled pines. July 25, 2020: On this final morning in camp, we'll enjoy the sunrise over a favorite small lake. Then, after a last hot breakfast, we’ll pack up and begin the 15-mile ride back to the Diamond 4 Ranch. You’ll be a riding pro by now, so relax and enjoy the views from the saddle! We’ll be back before dark, with time to enjoy a hot shower before dinner. July 26, 2020: We’ll have breakfast at the ranch, then meet for an extended image review and post-processing instructional. While there is no permanent electricity at the lodge, we’ll have a generator, projector, and large screen at our disposal. The workshop will wrap up at 3:00 PM, at which point we’ll depart the ranch for home. Travel to and from Allen's Diamond 4 Ranch in Lander, Wyoming. Medical Evacuation Insurance (required). Travel Medical and Trip Cancellation Insurance (optional, but recommended). Items of a personal nature, sleeping bag and pad, alcoholic beverages, and anything not specifically mentioned as included. Your deposit of $3,000 USD will secure your place in this workshop. The balance of $4,495 USD is due by April 1, 2020. All of our standard terms and conditions apply. 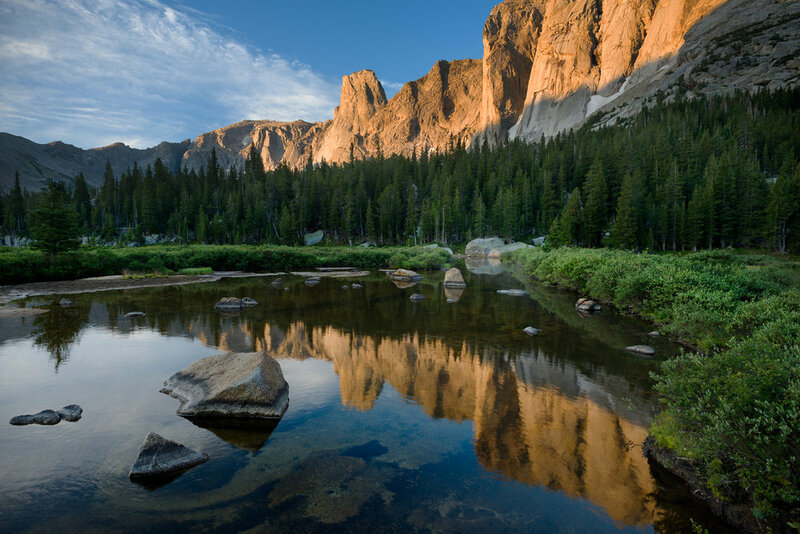 This is a rare opportunity to explore one of the most remote alpine locations in the lower 48 states! Don't wait, click the Sign Me Up button now.